Ketley Staffs Blue Quarry Tiles internally and Ketley Staffs Blue Pavers externally plus special bricks and bespoke quarry tile fittings or "feet"
The rectilinear plan is punctuated by landscaped courtyards and the entire western elevation extends into a wide veranda, which is sheltered from the rain by the deep overhang of the roof. Made from natural elements, quarry tiles and brick were ideal building elements that embodied the architectural spirit of the project. Staffordshire Blue quarry tiles have been used for the interior flooring, with matching blue pavers on the veranda. Almost 16,000 of the pavers were used in the outside spaces, with dimensions of 215x102.5x50 millimetres. A bullnose header detail, together with bullnose interior and exterior returns were employed to finish off the external paving on a raised terrace area surrounding the building, which impart a softer, more impressive edge. 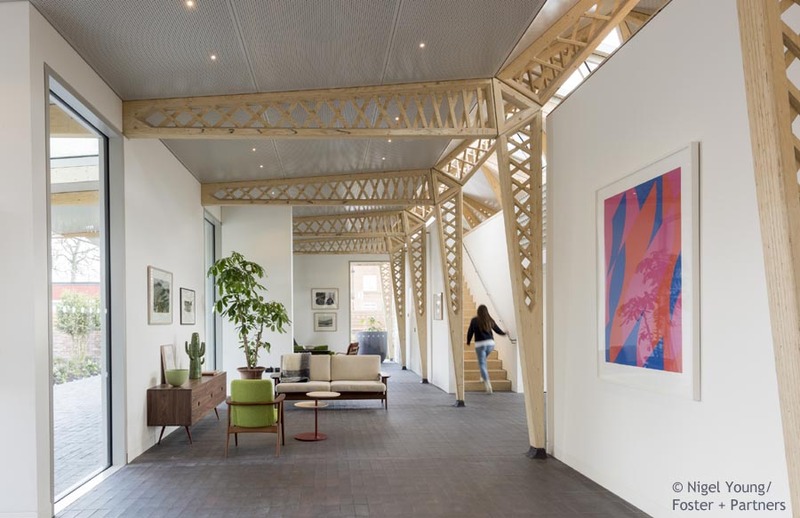 The building sits lightly on the ground and the points where the structure – timber trusses and slender steel posts – meets the ground is celebrated by ‘clay feet’. An important design feature, they protect the base of the columns throughout the centre and provide a neat junction to the paving. The design of the feet changed depending on the location of the columns. Foster+Partners produced 3D print of the designs which were then taken to site and checked to ensure they would fit. Once the designs were confirmed they were supplied to Ketley to match. The Ketley Specials team embraced the challenge, this was a glimpse of the way specials will be designed in the future and proved a greatly improved template from the normal situation of working from drawings. Due to the shrinkage that takes place during drying and firing of clay the models had to be scaled up to account for this. 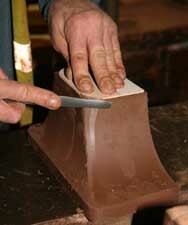 The feet were then cut from solid blocks of clay and shaped to match. As the feet needed to surround the steel core of the columns they needed to be cut out on the inside as well, this posed a challenge to maintain the shape during the drying process, this was overcome by placing a clay brace on the inside that would shrink at the same rate as the rest of the unit. The feet were then fired to the Staffordshire blue colour in a specials kiln. Externally Ketley Staffordshire blue pavers were used in a size to match the quarry tiles internally. 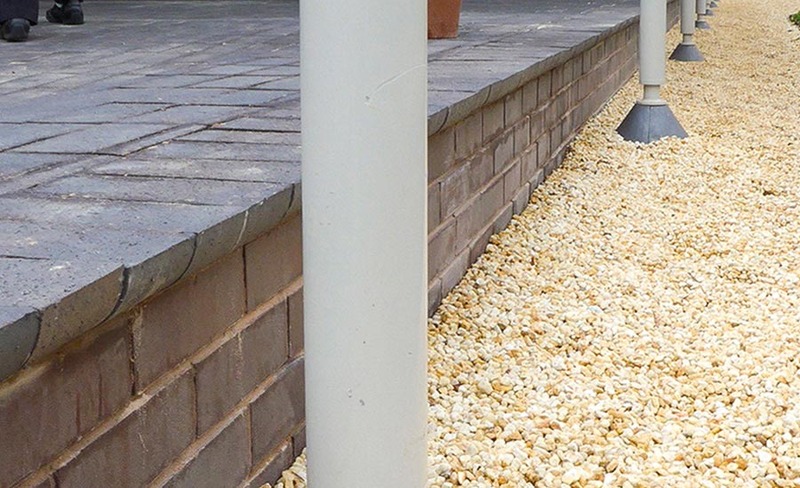 To finish off the paving which is on a raised terrace area surrounding the building, a bullnose header detail was used together with bullnose internal and external returns. The bullnose was on the underside of these edging pavers and they impart a softer impressive edge. 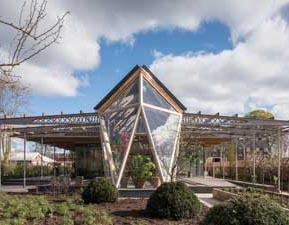 Externally feet were also required for the steel columns and for the glasshouse. The feet for the steel columns were in a cone shape again in Staffordshire Blue produced to match the 3D prints supplied. Much more complicated feet were required for the column bases in the glasshouse as they were required to fit with the glass sandwiched between the pieces. On the end columns the feet were made up of 3 parts with the angles required to match the sloping glass. 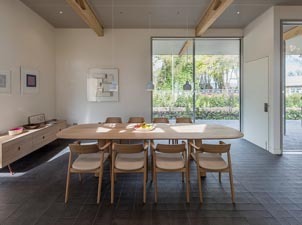 The building has sucessfully created a light and airy domestic atmosphere in a garden setting into which the protected spaces blend beautifully. 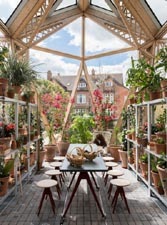 The transition from internal to external at the greenhouse end is practically well arranged and attractive. 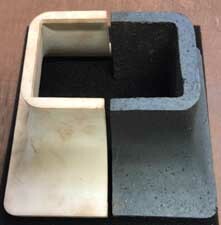 The purpose-made pavers have been used to "create exceptional brickwork techniques". This, with the careful consideration of detailing, combines to make a fantastic use of brick in an outdoor setting. 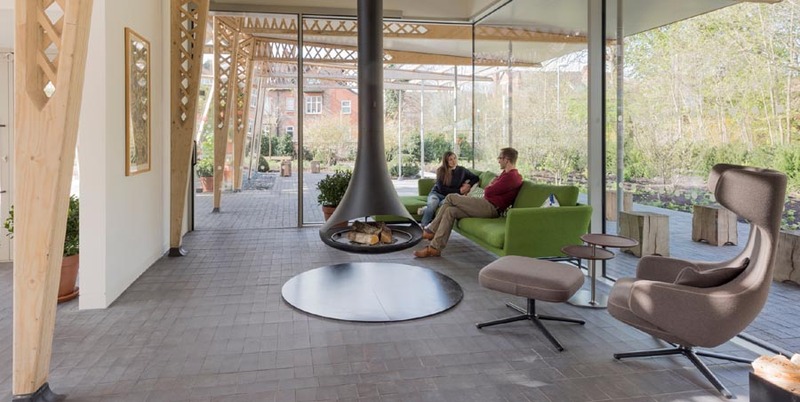 The staffs blue paving on the veranda and in the garden blend perfectly with the staffs blue quarry tiles inside the building helping to bring the therapeutic qualities of nature and the outdoors into the building, blurring the distinction between inside and out. "